Yep, that’s my very own Blue Spark (the orange one on the right) in my very own studio. Blue sent me one prior to release to test out and since this was a special occasion, we took it to a bigger studio, my friend John’s Audioworx Studio (pardon the horribly designed site, I built it a long time ago and never updated it). Its pretty straight forward. We’ve got a classic looking powder coated orange body with Blue’s signature look. Classy right?And if that’s not enough for you, check out all of the goodies you get with the mic: A very nice wood box, redesigned pop filter, and shockmount. The packaging is incredible even down to the brochure which looks like a book of matches… clever. I actually got one of the first shipments of the Spark and as you can see in the pic, the shockmount engulfs the mic, protecting it from just about anything life could throw at it. Since then, Blue has updated the package to have a “saucer style” shockmount that makes this mic less cumbersome to set up, especially when miking acoustic guitars. On the right hand side of the page is a picture showing what the new updated shockmount for the Spark looks like. As you can see the mount is less in the way and allows you to get to that “focus switch” easier. Another great update to the Spark is the pop filter. The pop filter that comes with the baby bottle is a bit of a pain, but this one screws right into a hole in the back of the stem that connects the capsule to the body. The pop filter works great as well. It fits very sturdily and stays put. So is all of this tinsel just overcompensating for a lackluster mic? Honestly, I really don’t understand how and why Blue sells this mic as low as they do… I would’ve paid $200.00 just for the mic alone with no extras for that price. Seriously, HUGE props to Blue for this one. They’ve touted this mic as an entry level mic but I really think they’re being modest. So lets try to find something negative to say about this mic. The frequency response on this mic is pretty flat, with some slight bumps in the high end, but without giving it that really abrasive, teeny, high end cut through you get from most of the starter mics that companies put out. This mic has a very smooth response, making it one of those great workhorses for any home, project, or even professional studio. Spark even has a small button on the back that Blue calls a “Focus Switch.” A lot of different people have quite a few explanations for what it does but simply put, it trims a little more than the normal mic does by shelving off 1ooHZ to give more attention to the mids and highs, thus “focusing” your signal to the upper end of the spectrum. Blue has even gone back to the drawing board with the capsule too, giving this mic an all new 23MM diaphragm and a 25MM capsule. Technical jargon and fancy words aside, I threw the book at this mic. I tracked every instrument I could get my hands on and even did some A/B comparisons against some pretty big hitters, including a Neuman U67, but we’ll get to that part at the end. I couldn’t find an application that this mic wasn’t exceptional at. 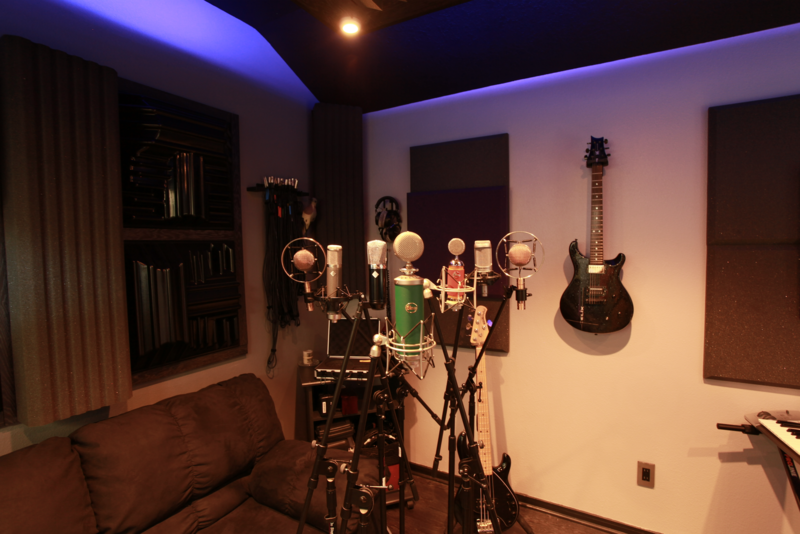 Room mics, guitar cabs, drums, guitar, vocals, this mic does it all with ease. The response on the mic is very smooth while adding punch when needed. After that initial session, I keep this mic within reach at all times especially for acoustic guitars. My J45 is a tough guitar to mic being as the guitar is very boomy. Most mics sound extremely muffled but Spark made nice with the guitar right off the bat. The focus switch really brought out the classic sound a J45 has and when I ran it through a middle-of-the road preamp, I needed very little EQ if any. To sum it up, this mic could go head on with any $800 – $1000 mic easily and even can hang with some of the big players as well so don’t take the low price point as a sign of cutting corners or typical boring run-of-the-mill starter mics. This mic is a huge game changer for the entry-level field. Now for the A/B test against the Neumann U67. These samples might be a little quiet but like I said, I didn’t use any compressors or anything so you can get the raw sound of the mic ran directly into the pre. I kept the mics about a foot an a half away and had the gain coming in around -6db. Here is an acoustic guitar ran through the U67. See what I was saying… Sure the Neumann has more low end but the Spark hangs in there with it only having maybe a slight too much highs but nothing a slight roll off of highs wouldn’t tame. When I showed my friends who have nothing to do with recording, every time they all picked the Blue because of it’s more pronounced high end and clarity. Now I’m not trying to insist that a $200 mic with all sorts of extras is just as good as a $2400 mic, but just let the audio be your guide on that one. I truly wish I had something bad to say about this mic to balance out the review but so far the only issue I’ve had was addressed and fixed by Blue… Why so much of a shockmount? So I basically have nothing remotely negative to say about the mic and if you think I’m being generous with my review, look up any other review. I’m not alone on this one. Great job Blue. You’ve given all of the other entry level mics out there great cause for concern.